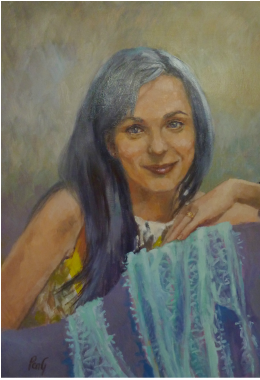 Since a portrait is ultimately a collaboration between this artist and her client, the importance of clear communication is tantamount, therefore Penelope prefers to work directly with you, her client, in order to insure that your expectations be not only fulfilled, but surpassed. These prices are estimates. If you add another figure additional prices apply. Happy to negotiate with a client. You can either sit for me which can be approximately 3 sittings of 2 hours or more (if more is in the painting) or photographic session. I like to photograph the subject and the client then chooses which image they like best. A portrait isn't just taking a photograph. I like to get to know the subject and so personality is included in the Portrait. I also can be commissioned to paint a deceased person from your photos. Once the price is decided upon, a 30% deposit is required and the client has up to date detail on the paintings progress. Full payment on completion to the clients requirements. Diploma Painting/Fellow Royal Queensland Art Society/Master Pastellist and Life Member of Pastel Society of Australia.